Archimedes attended the AEGC 2018 25th Australasian Exploration Geoscience Conference in Sydney, Australia, on February 18-21st, 2018. Archimedes had a Poster called "Improved Imaging of the Sub-Surface Geology in the Mowla Terrace, Canning Basin using Gravity Gradiometry Data". Archimedes attended the APPEA 2018 Conference and Exhibition in Adelaide, Australia, on May 14-17th, 2018. Archimedes had a poster presentation titled "Mapping Geology beneath Volcanics using Magnetic Data". Archimedes has contributed to a previous edition of the GEO ExPro App, ‘New Technologies’. Fault interpretation is carried out by Archimedes using an Automatic Curve Matching (ACM) method applied to located magnetic data. ACM analyses a single magnetic anomaly along a flight line or profile extracted from a gridded Total Magnetic Intensity (TMI) field in a purely automatic manner. This method works by identifying a magnetic anomaly on a profile, comparing the unique sets of components of the observed anomaly with the one that is computed for a theoretical prism, plate or edge model, varying the parameters and accepting the solution which provides the best fit. The first stage in the ACM method is to extract profile data and prepare for analysis. The profiles are extracted from the TMI grid in the four directions: NS, EW, NW-SE and NE-SW. Single magnetic anomalies are anaylzed along the profiles running in four directions over the entire survey area. These profiles are then scanned to identify the anomalies in certain wave-length ranges arising from different depths. A narrow scanning window identifies high frequency anomalies, caused by shallow sources; a wide window sees deeper magnetic sources generating long wave-length anomalies. A series of theoretical models with different parameters capturing the variation in shape, size and magnetisation of potential magnetic bodies is prepared. A dyke-like body where the depth extent is much greater than the depth to the top of the body; this could be used to approximate the bulk volume of the concentration of magnetized material. An edge or contact model; this could be used to approximate geological contacts. The observed data and profiles are extracted from grids of the TMI field and are then scanned with a range of window sizes designed to detect anomalies arising from different depths. Each single anomaly (observed and theoretical) can be represented by vertical and horizontal components, which can be further split into symmetrical and asymmetrical functions. Therefore one anomaly is represented by a unique set of four functions. The process of comparing such a set of functions representing the observed anomaly with the theoretical anomaly is known as 'curve matching'. Stringent similarity coefficient (a measure of the goodness of fit of the four matched functions) cut-offs are used to ensure best fit and high confidence results. By taking this approach a unique solution showing: depth, width, dip and magnetic susceptibility of the causative body is obtained. The ACM technique computes depth, susceptibility, and geometry of the causative body, as well as a similarity coefficient. This is repeated for each model and in each profile direction. 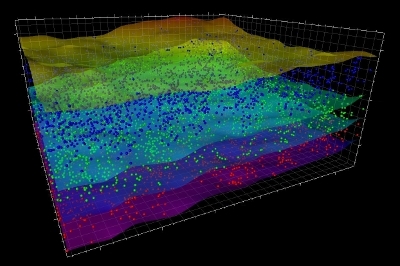 The results obtained are then combined into a 3D data volume. 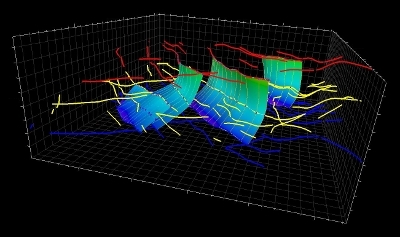 The 3D volume can then be taken into a work station where the visualisation tools can be used to interpret lineaments and potential faults. The results are further analysed to identify the most statistically significant results, which are visualized in 3D. Manual interpretation is carried out, generally in the planar view of successive depth intervals panelling through the volume of the data. The lineaments at multiple depths can be joined vertically, that allows identification of the large scale faults in 3D. By examining various combinations of the theoretical models, as well as different directions of the profiles and analysis of computed susceptibilities, structures within the sediments and the underlying basement are interpreted. The ability to identify faults can be affected by several factors including the extent of magnetization along the fault plane and the contrast in magnetic susceptibility of the rocks on either side of the fault plane. These factors can make identification of both non-mineralised and mineralised faults possible. When the ACM results from all the profile directions supports the presence of a fault, and the lineaments can be correlated laterally and at depth, a fault plane can be gridded in 3D. Archimedes approach to the interpretation of high resolution aeromagnetic data allows the detection in 3D of faults, associated structures and even fracture patterns within different sedimentary formations, as well as the underlying basement. Results are delivered in work station ready formats for integration with other geoscience data. Our proprietary techniques extract the maximum information and deliver a detailed interpretation to aid in further exploration and development.